We are on a change over to feature each of the designers, reduce the overwhelm when it comes to an overloaded blog, and to give you more opportunity to follow and learn from each of the designers when they post. So the Saga will happen each month with 7 designers (including me) posting through out the month. We will be introducing guest designers periodically and continuing with awesome of contests. I created a combo card combing the Surf & Turf for a scenescape of fly fishing. I played around with the stamp sizes and picked Exstream to create my water. As I sized up the trout, fly, eagle, bear and Big Horn Sheep, I settled on the Eagle, Big Horn Sheep & Happy Father's Day Stamps. I added all of the images, sketched in some extra shore and hillside, and then began to water colour paint my scene. I use my craft sheet to colour all if ink onto and then I used a wet paint brush to pick up and fill the scene with colour. I decided that the Big Horn Sheep and Eagle were a tad too big so I stamped them on shrink film and hit them with my heat tool. making them small and easier to place in proper proportion. (I think they were slightly too small but smaller looked better then too large. When I was done, I cut some 1" cork strips and then folded them to break them giving me a rugged outer edge with a smooth inner frame. and then I rubbed direct to cork, with the Distress Oxide Walnut stain to get the right look. Next up was the corrugated cardboard sheet. I inked, it, stained it, added water, dried it, stained it, sanded it, tore it, and stained it again. Finally a look a wanted. Then, I layered all of the layers and placed them on my super stock, to make sure the card was the correct size. Now if you are wonder why I used superstock, when I sell white cardstock, here's the answer...This stuff is amazing! Cathie Allan has been stamping since the before so many of today's companies hit the market. She teamed up with Creative Scrapbooker and they found a 130lb 12x12 cardstock that rocks. I use it for most of my heavy card backers because when adding 10 layers my cards can be too heavy to stay standing. Super Stock does the trick and I added some walnut oxide ink to the front and wet it to maintain the look of the card. Because I was still unsettled on the balance and streakiness of the water, a painted some watered down Adirondack Pear over the water and achieved a gorgeous effect. Then I smeared the beacon 3 in 1 on the Shore lines and glued on the Charred Gold Embossing Powder. DO NOT heat! In its raw form, Charred Gold makes for a perfect sandy/dirt look. Then I glued on a bit of forest foliage, but this one I heated until it just started to melt, giving a rough greenery texture that I just fell in love with. I still felt something was missing so I stamped onto the think shrink film, Happy Father's Day, added a light smear of Hickory Smoke Paint to the back and slightly wiped it off (this gave a pop to the words), and then attached it with the Lion Crest brads. Viola, my Surf and Turf card is done! Follow along, link up your projects and thank you for continuing to support all of us and each other. Dream a little Dream Dare with her Dreaming of the Sea entry. 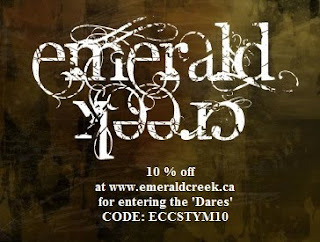 Kerstin please email Kim at info@emeraldcreek.ca for your prize code. Fabulous masculine project, Kim! I love how you can incorporate those stamps to make this scene. Great use of the embossing powders! Congratulations to Kerstin, Jannet, Irit, and Carol! Such amazing projects this month! Outstanding!! I truly love when you get the time to create, it's always inspiring and I learn something new!! Congrats to the winners, beautiful projects!! Awe, thanks so much Cathy. It's fun to be posting again! Thanks Katelyn! I wish we could have had more creating time together. Great card, nice scene you put together. Very cool brads! !